Today we are enjoying a sunny, upper 50’s kind of day. One that speaks of spring coming. The crocus are up, daffodils showing color, and birds are singing in surround sound. Welcome spring! It’s been a cool, rainy winter with cactus and succulents tucked away in greenhouses, hoop houses, basements under lights, and into window sills. In general, our plants go begging for light about 8 months of the year. Supplemental light helps and getting them out for the summer makes the plants grow like crazy. We often find our spherical cacti becoming “cone heads” – etiolating in the lower light of winter. We grow our plants dry for the winter, letting them long for that first short drink of water in April when the temperatures are warm enough the roots won’t rot. Some members of our club have turned to winter growers, the plants from South Africa which go into high gear as everything else settles in for the long winter’s nap. For example, Pachypodium namaquensis. We enjoy seeing these plants come to our meetings in their full bloom regalia. 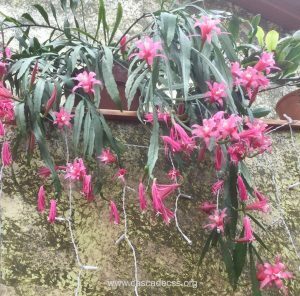 One of our members delights us with various succulent orchids in bloom in late winter. We grow plants in the Northwest against all odds, enjoying the challenges while enduring the heartbreak of an $80 Ariocarpus that doesn’t make it through the winter. We live and learn and share stories. Maybe our club is more of a support group!